Hubbard (The Afghan Handbook, 1951) writes "She is obviously one of the genuine mountain type, with the thick hair and topknot promising to develop into the full story of an Afghan Hound's coat. 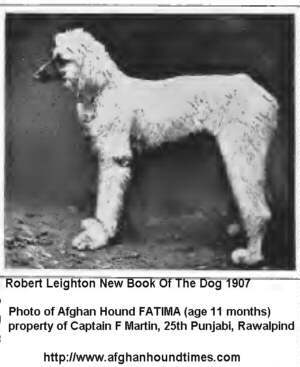 Hubbard continues and references The Illustrated Kennel News of May 1907 which included a column entitled "Echoes of Fancy" Quote - The photograph shows the thicker coat (which later will probably get corded), the hair on the top of the head, and more powerful build of the Afghan, Barukhzy, Kurrum Hounds..... Our correspondent says that a friend of his who had lived in Afghanistan had never seen a dog like "Fatima", but this [proves nothing: The Afghan Hounds, like the "Rampur" are rather less reliable in temper than the Persians (although some of these are very nasty. It all depends on the bring up. Unquote.